The uses of Limestone as a building material and as a raw material for making other useful materials. 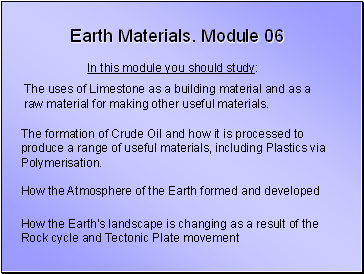 The formation of Crude Oil and how it is processed to produce a range of useful materials, including Plastics via Polymerisation. Limestone is a commonly occurring rock which can be used not only for building, but also for making many other useful materials including Lime, Cement and Glass. It is also added to Bread and Toothpaste. 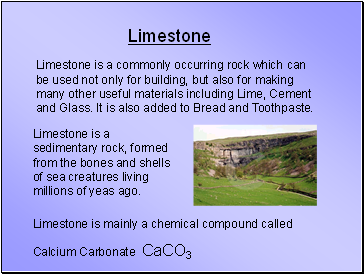 Limestone is a sedimentary rock, formed from the bones and shells of sea creatures living millions of yeas ago. Adding too much Limestone will not cause too much damage to the environment. Also it does not get washed out by heavy rain as an alkali would. 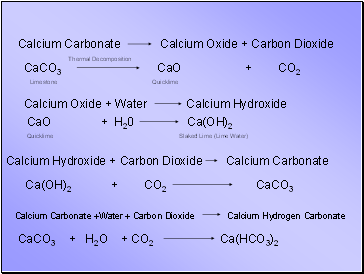 Carbonates generally break down when they are heated. This is called Thermal Decomposition. 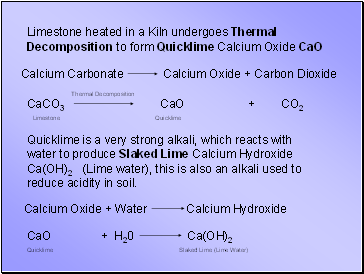 Quicklime is a very strong alkali, which reacts with water to produce Slaked Lime Calcium Hydroxide Ca(OH)2 (Lime water), this is also an alkali used to reduce acidity in soil. 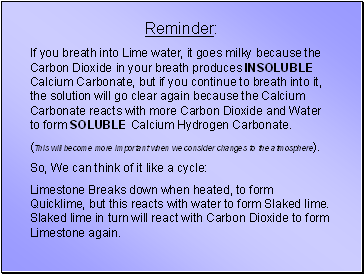 If you breath into Lime water, it goes milky because the Carbon Dioxide in your breath produces INSOLUBLE Calcium Carbonate, but if you continue to breath into it, the solution will go clear again because the Calcium Carbonate reacts with more Carbon Dioxide and Water to form SOLUBLE Calcium Hydrogen Carbonate. (This will become more important when we consider changes to the atmosphere). 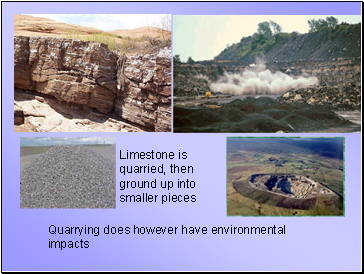 Limestone Breaks down when heated, to form Quicklime, but this reacts with water to form Slaked lime. 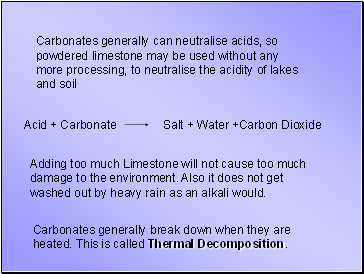 Slaked lime in turn will react with Carbon Dioxide to form Limestone again. Why not burn them then?